Download "Aim for the Horizon. Security. Growth. Flexibility. Strength. 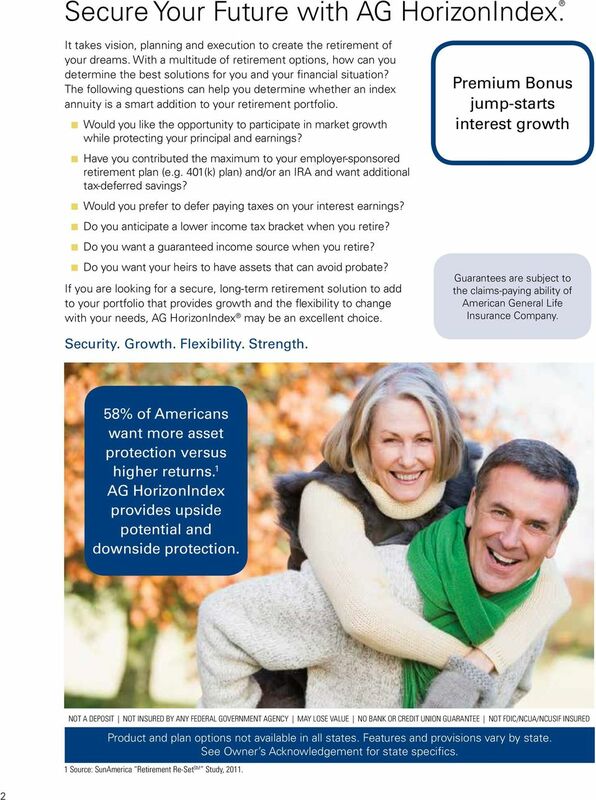 CONSUMER Guide"
1 CONSUMER Guide AG HorizonIndex 9 Annuity AG HorizonIndex 12 Annuity index single-premium deferred annuity with premium bonus, market value adjustment and AG Lifetime Income Builder optional living benefit rider Aim for the Horizon. Security. Growth. Flexibility. Strength. 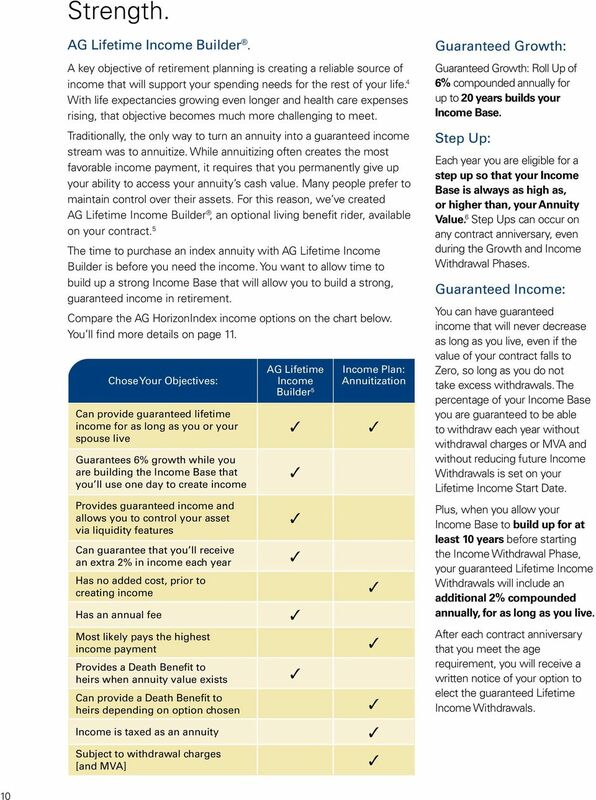 This guide must be presented along with the Lifetime Income Builder Consumer Guide. 3 Security. Principal Protection with Growth. 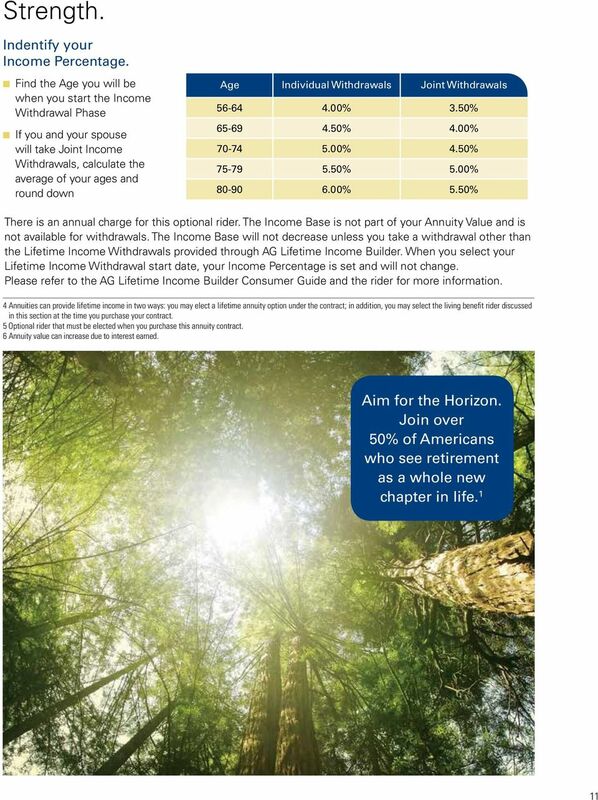 AG HorizonIndex is a retirement savings vehicle and a source of income for the future. In addition, with AG HorizonIndex you have the security of knowing that your premium (the amount you initially put into your contract) is protected from market risk. 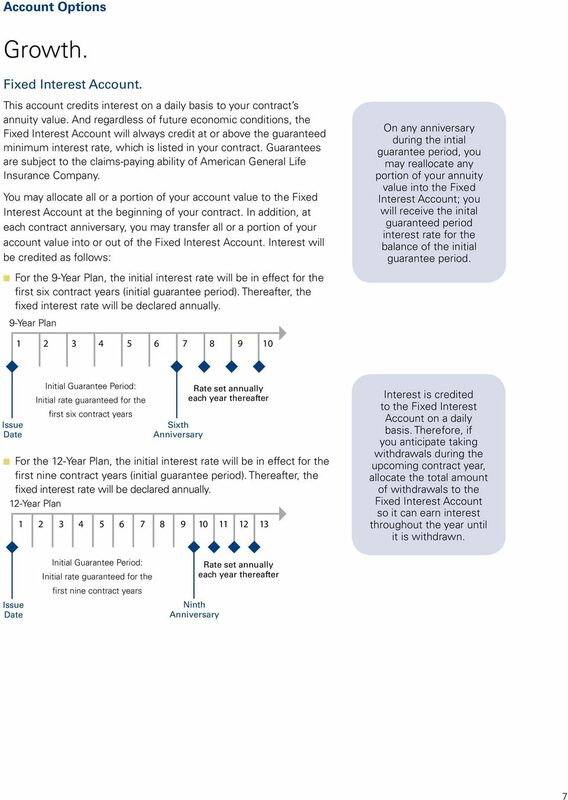 Protection of Interest. 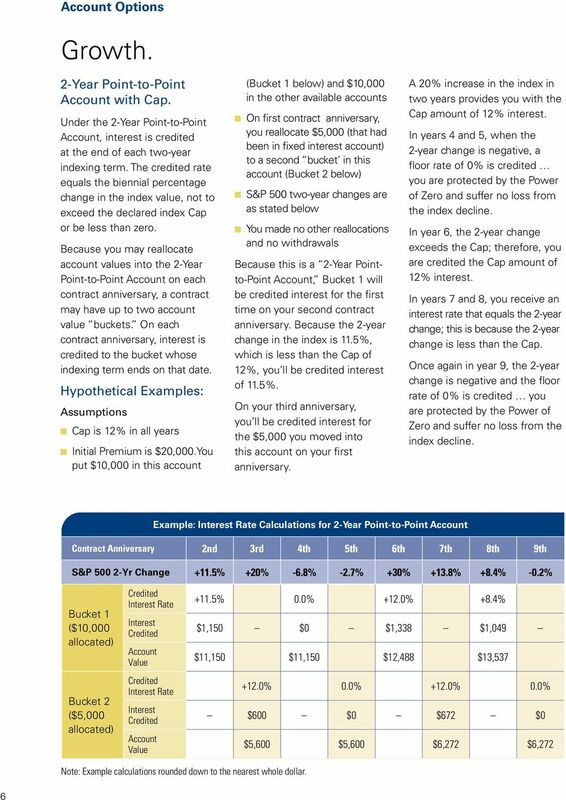 Once interest is credited to your annuity value, it cannot be lost, even if the S&P experiences downward trends. Protect Your Loved Ones. 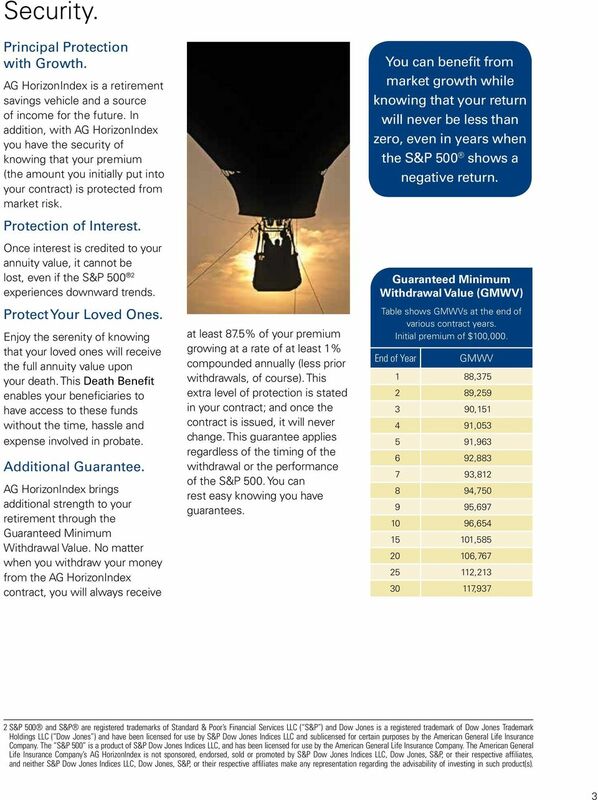 Enjoy the serenity of knowing that your loved ones will receive the full annuity value upon your death. This Death Benefit enables your beneficiaries to have access to these funds without the time, hassle and expense involved in probate. Additional Guarantee. 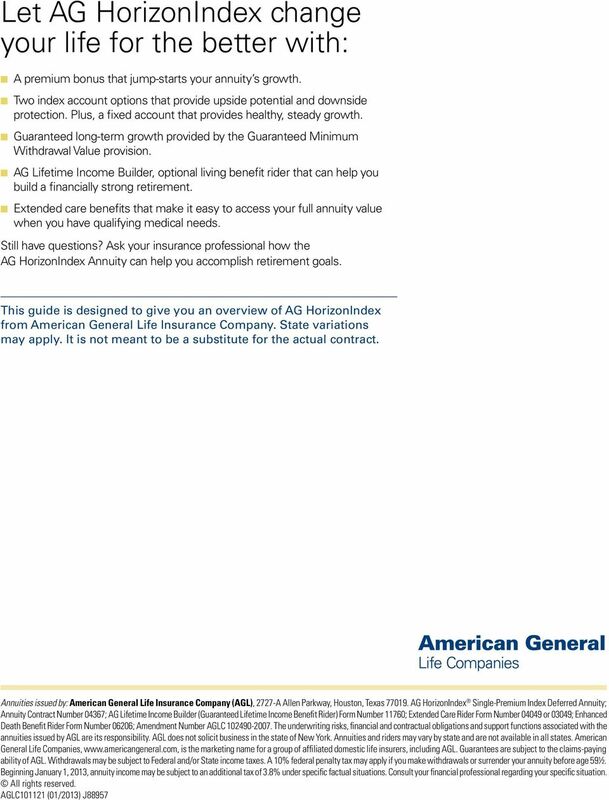 AG HorizonIndex brings additional strength to your retirement through the Guaranteed Minimum Withdrawal Value. 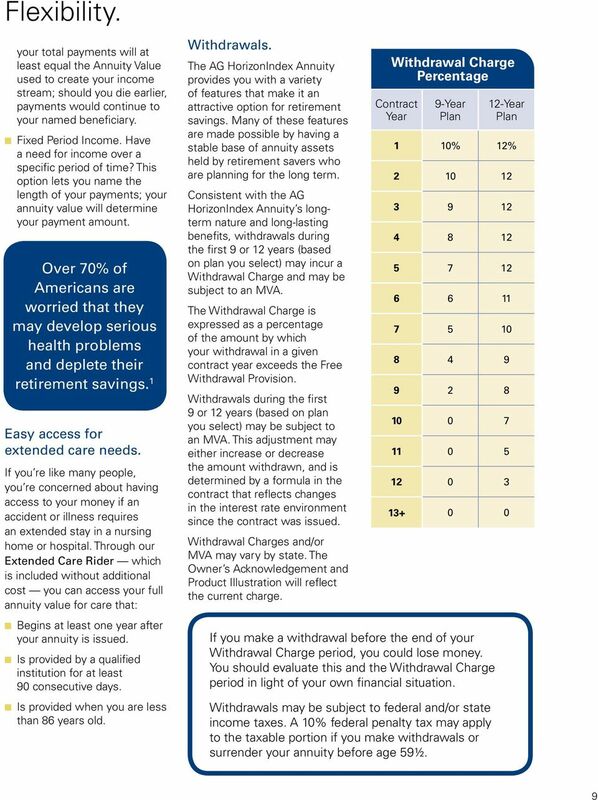 No matter when you withdraw your money from the AG HorizonIndex contract, you will always receive at least 87.5% of your premium growing at a rate of at least 1% compounded annually (less prior withdrawals, of course). This extra level of protection is stated in your contract; and once the contract is issued, it will never change. 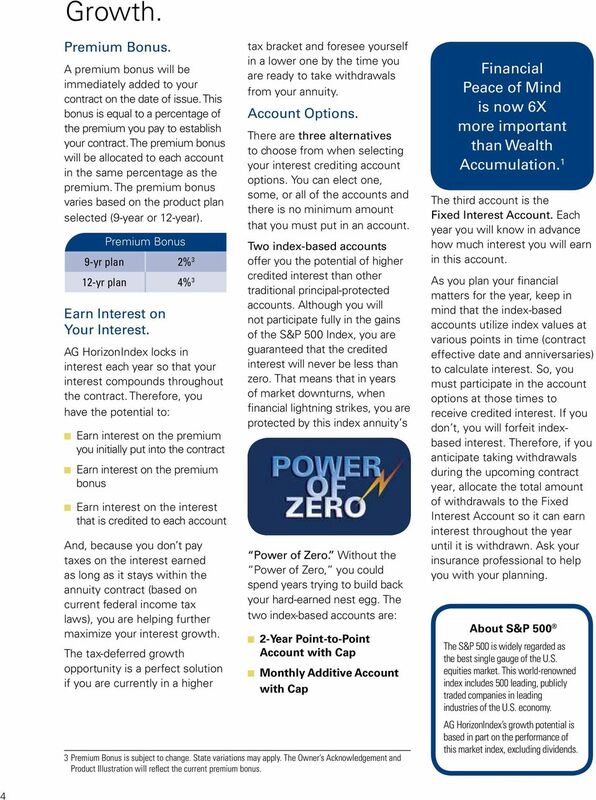 This guarantee applies regardless of the timing of the withdrawal or the performance of the S&P 500. You can rest easy knowing you have guarantees. 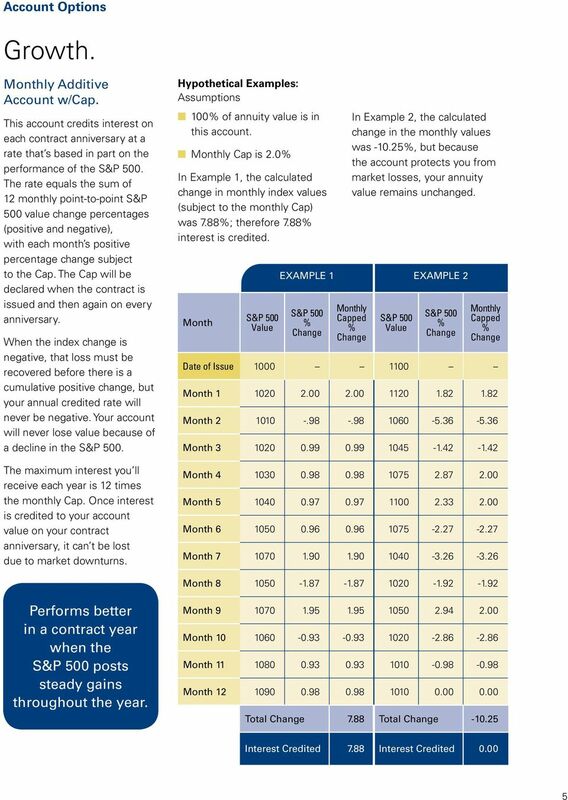 You can benefit from market growth while knowing that your return will never be less than zero, even in years when the S&P 500 shows a negative return. 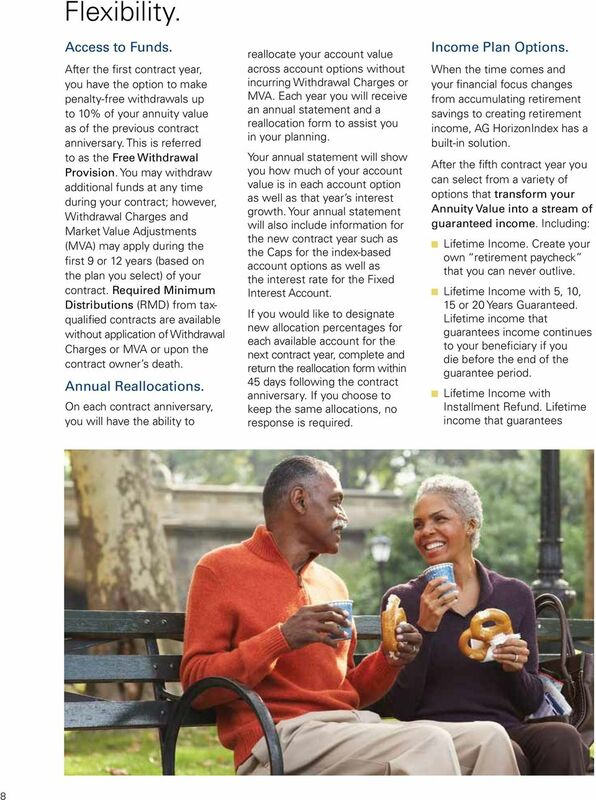 Guaranteed Minimum Withdrawal Value (GMWV) Table shows GMWVs at the end of various contract years. Initial premium of $100,000. End of Year GMWV 1 88, ,259 90, , , ,88 7 9, , , , , , , ,97 2 S&P 500 and S&P are registered trademarks of Standard & Poor s Financial Services LLC ( S&P ) and Dow Jones is a registered trademark of Dow Jones Trademark Holdings LLC ( Dow Jones ) and have been licensed for use by S&P Dow Jones Indices LLC and sublicensed for certain purposes by the American General Life Insurance Company. The S&P 500 is a product of S&P Dow Jones Indices LLC, and has been licensed for use by the American General Life Insurance Company. 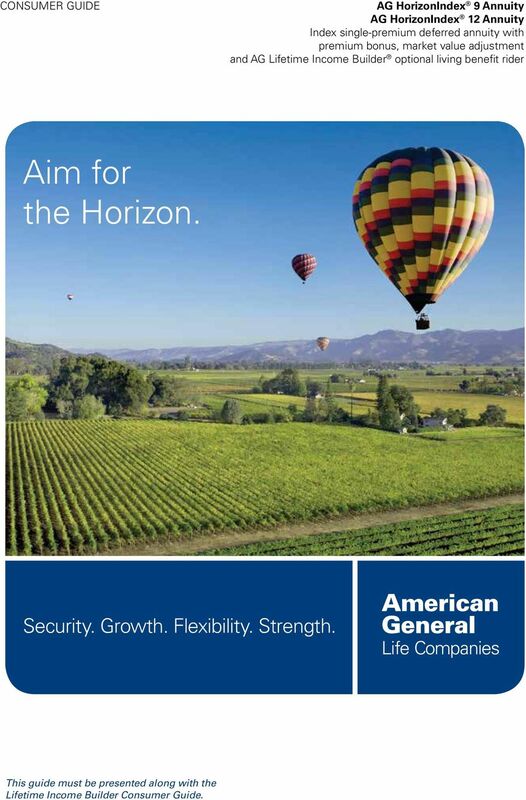 The American General Life Insurance Company s AG HorizonIndex is not sponsored, endorsed, sold or promoted by S&P Dow Jones Indices LLC, Dow Jones, S&P, or their respective affiliates, and neither S&P Dow Jones Indices LLC, Dow Jones, S&P, or their respective affiliates make any representation regarding the advisability of investing in such product(s).